Alphonso Davies' humble beginnings are fuel for the inextinguishable spirit that got him to where he is today. If Alphonso Davies had a collection of journals, they would make for a fascinating read. At 18, he is the face of Canadian soccer – conceivably the most gifted soccer player to have come out of the MLS. In the new year, he will be unleashed on the Bundesliga at Bayern Munich. What happens next is a tantalising prospect, but it is where Davies has come from - rather than where he is going - that makes his such a tellable tale. The journey began in Buduburam, a Ghanaian refugee camp, where Davies was born after his parents had fled the civil war in Liberia. Life was fraught with difficulties. The search for clean water, food, simply staying alive; every hour that passed a triumph of survival. There had to be a better way. "It was hard to live because the only way you survive sometimes is you have to carry guns," remembers Alphonso's father, Debeah. "We didn't have any interest in shooting guns. So, we decided to just escape from there. They have a program called resettlement, and they said 'OK, you have to fill in a form for Canada.' We went through the interview and everything, and made it, and came over here." The Davies family were able to immigrate to Canada when Alphonso was five, eventually settling in Edmonton, Alberta. Debeah and the family matriarch Victoria worked long hours to make ends meet. Even Alphonso chipped in around the house, helping raise his two younger siblings whilst attending the Mother Theresa Catholic school, where his talents first caught the eye. "Our little Alphonso," said Davies' Grade 6 teacher and sports coach Melissa Guzzo. "He's just one of those kids who had a permanent smile on his face, always dancing in the hallways. He's such a natural talent. Anything he touched — track, basketball, any sport — he was the kid." Sensing something in the Edmonton air, Guzzo touched base with Tim Adams, the founder of Free Footie - a free after-school soccer league for inner-city kids in Elementary grades 3, 4, 5 and 6 who can't afford registration fees and equipment or get transportation to games. Adams quickly realized that Davies was no ordinary kid. "I saw him make his first touch, and I knew, immediately. This kid has a gift for the game," he recalled after witnessing just a few minutes of Davies magic at a Free Footie end-of-year tournament. "Other kids I've seen have had that level of athleticism. But he had the mind. He was way more than a guy who could kick the ball into the back of the net." Instinctively, Adams had also called local soccer coach Marco Bossio to check out the tournament. The St. Nicholas Soccer Academy boss wasn't disappointed. "There was something special about this boy," Bossio said. "He had lightning-quick feet and speed with the ball. I knew that was something special at that age. I asked him what his plans were and he told me he would be playing for us next season. We were delighted. We have a lot of kids from different communities, so he fit in right away." Shortly after joining St. Nicholas, Davies met Chernoh Fahnbulleh, who is originally from Liberia but immigrated to Canada in 2008. The pair were inseparable and are still good friends to this very day. "He spoke English but it was, like, broken English," Fahnbulleh told The Star Edmonton. "We were all in the same drama class, so then for the drama thing we all get in a group and then we act out something or read a book together. His coach would help him out a lot, too, they would always go to a whole bunch of places, and the coach would introduce him to other people … everybody in the soccer community already knew Alphonso, anyway." With the entire population of Edmonton in his corner, it was during his formative years at St. Nicholas that Davies first began to entertain the idea of pursuing soccer for a living. "To be honest, I was just trying to play for fun, to keep myself active and keep myself out of trouble," Davies said. "I didn't think I was really good, I was just playing the game because I enjoyed playing it with my friends. Then once I started playing organized soccer, parents, coaches and other teammates were telling me to keep going and that I could become something so I started believing it. That’s what started me wanting to become a professional. That’s when I started training hard to become a professional." Davies' readiness to go that extra mile – a quality he attributes to his parents' experience in war-torn Monrovia – saw him outgrow St. Nicholas and later the Edmonton Strikers. By the age of 14, he was enrolled in the Vancouver Whitecaps’ residency program. His progress was rapid and, after becoming the youngest player to appear in the United Soccer League, he made history as the first player born in the 2000s to play in the MLS. He was just 15 years, eight months and 15 days old. "When he came in, we knew that he was a prospect for sure," said Whitecaps president Bob Lenarduzzi. "I"m not sure that we would have gone overboard at that point and said he was going to make it and be something really special. For me, he's a little bit of an anomaly. When he came in, he was part of the U16 team and within months he went from U16 to U18, WFC2 [Whitecaps Football Club] to the senior team. That's very rare that happens, and it's very rare that it will happen that much in the future." A once-in-a-generation talent, Davies was soon on the national team's radar. He had already represented the country at U17 and U20 level when he was called up for the senior side, debuting against Curaçao on 14 June 2017. He had only obtained his Canadian citizenship a week earlier. "That was a great moment for the family," Davies said. "I'm glad I could get it. It's going to mean a lot, representing the country I've lived in for most of my life. Having that [Canadian] crest on my chest playing for them is going to mean a lot for me." The Davies household watched on in awe as Alphonso, still 16, later became Canada's youngest ever goalscorer and the youngest to score at a Gold Cup with his brace against French Guiana, as well as the first player born in the 21st century to score at a major international tournament. A star was born – but Davies represented more than just a prodigious athlete. 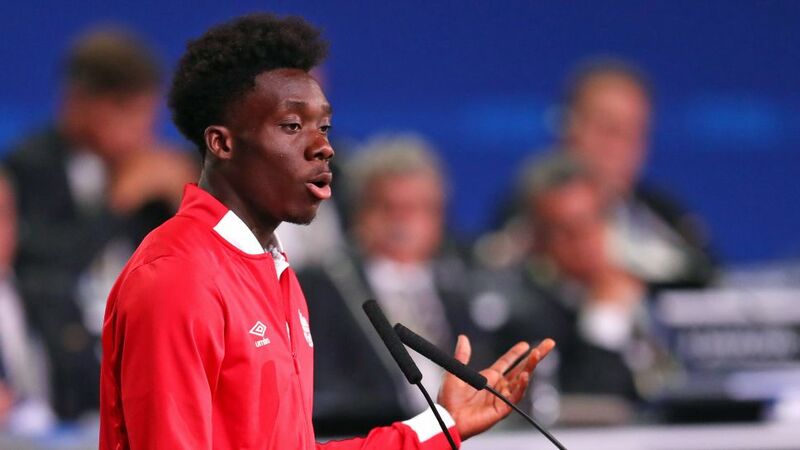 "Alphonso Davies is somebody that all our players can aspire to become," Canada national team coach John Herdman told the Edmonton Sun. "He underlines what Canada is. It is a country that accepts all." Before agreeing to join Bayern for an MLS record fee in July 2018, Davies spoke at a FIFA Congress on behalf of North America's 'United bid' to host the 2026 FIFA World Cup. He explained how Canada had welcomed him and his family as they sought refuge from Liberia's bloody civil war; a journey that took him from a refugee camp in Ghana, via Edmonton, to a career in professional soccer. The impact of his words was undeniable. "I don't know what you were able to see back home, whether they showed the photos or not, but they showed photos of him when he was five years old, him coming to Canada and Canada adopting him as his home country," said Peter Montopoli, General Secretary of Soccer Canada, after FIFA awarded the 2026 World Cup to Canada, Mexico and the USA. "It was very compelling and very inspiring and very emotional. He was just the perfect guy to start with. He is what this bid was all about — being united." Despite his budding national hero status, Davies' feet are rooted firmly on the ground. He has no recollection of the refugee camp in Ghana where he was born. He can only try to comprehend the horrors faced by his parents in Liberia, but the soon-to-be Bayern man is grateful for the opportunities he has been given and fully appreciates how different life might have been. "He's got a good head on his shoulders," commented Lenarduzzi. "Very early in his life, being a good person was obviously very important to him and his family, and you could see that they didn't just talk about it, they implemented it. That's refreshing, because in this age of the Millennial, that doesn't happen a lot. It almost seems like it's a movie right now, and we're at the start of the movie with his family and life background, how he got to us - but there's still a lot more of the story to be written." Having wrapped up his MLS chapter on 28 October 2018, Davies will officially join Bayern on a five-year deal in January 2019. History suggests the as yet unpenned 'Munich Years' will be well worth the read.